Have you got Facebook marketing questions? 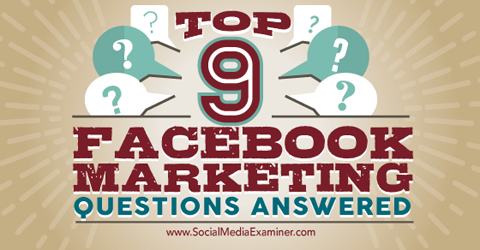 Are you wondering what the most common Facebook marketing questions are? Businesses with Facebook Pages often have the same questions. In this article I’ll dive deeper into frequently asked questions for businesses on Facebook. #1: Can I Change My Page Name? Click the About tab below your page’s cover photo. Click Page Info in the left column (it may be displayed automatically). Hover over the Name section and click Edit on the right side. Enter a new name and click Save Changes. If you have fewer than 200 fans, changing your name is easy. If you have more than 200 fans, there are a couple of options. If you’ve never changed your page name before, you should be able to change it one time. But be very intentional with this change–you won’t be able to change it easily after this. And unfortunately, some people don’t have the option to change their page name even if they haven’t changed it before. If you have the capability to request a change on your page, you’ll see the Request Change link on your About tab. If you have over 200 fans, you may be able to request a name change. Once you click Request Change, fill out the form that appears. You can expedite this process if you have official documentation of your branding. Fill out the form and add documentation to expedite the process. If you don’t have this option, the process is more difficult. You’ll need to go through Facebook’s Help section, and it may take a while to get a response. Here’s the Help section for reporting a problem with pages. #2: Can I Change My URL? Your page URL or website address is also known as your username. It’s the exact address that someone can type in to get to your page; for example, www.facebook.com/smexaminer. You can change this address one time only. When you first create your page, you’ll have a very long, unwieldy URL. 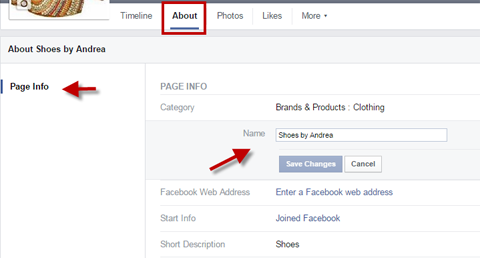 By changing it to a shorter name, you can more easily direct people to your Facebook page. To change your URL one time, go to www.facebook.com/[username]. Make sure you’re setting your page website address and not accidentally setting your personal website address. 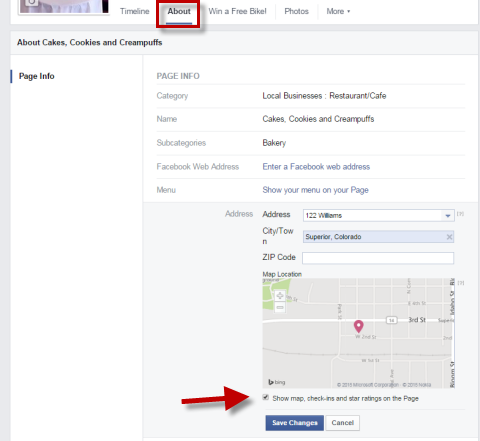 You can change your Facebook page web address one time after it has been set. Note that you can capitalize words in the address, but capitalization isn’t a factor in getting to the page. Someone can type in lowercase or uppercase letters. Also, the address can contain only alphanumeric characters–no spaces. 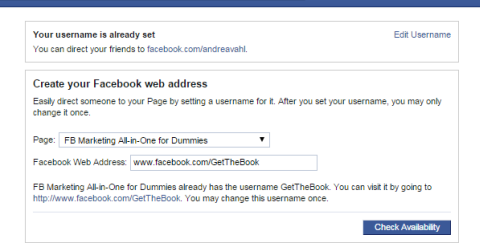 And you must be an admin of a page to set the username. If you’ve changed your username one time and aren’t able to change it again, you have to go through Facebook’s Help process to change it. And then it would probably need to be a company branding change. #3: How Do I Merge Pages? If you have two pages that are about the same thing and have the same names (or almost the same–Facebook requires that they be very similar), it’s a good idea to merge the pages. Merging duplicate pages merges the fans, ratings and check-ins of both pages. However, the posts, photos and username are deleted from the secondary page. You can keep the full post history from only one of the pages. You’ll be able to select which page you want to keep. You must be an admin of both pages to merge them. You can get to the Merge area from the General Settings of your Facebook page, or you can go there directly at https://www.facebook.com/pages/merge/. Access Merge Pages from the Settings area or go directly to the URL. After you click Keep Page, you get one more confirmation message, and then the pages are reviewed for possible merging. After you select the pages you want to merge, select which page you want to keep. 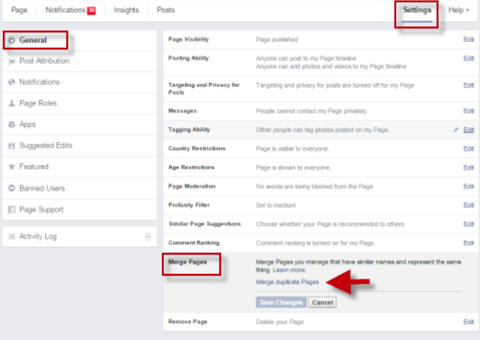 Facebook will notify you when the pages have been merged or give you a reason why they haven’t been merged. It helps to have the pages’ names, locations and other information the same so it’s clear to Facebook that they represent the same business. Remember that the URL of the page you don’t keep is also deleted. If you find a page that is not under your admin control (but represents your business) and you want to merge it, see Question 9 later in this article. #4: Can I See Who My Fans Are? Only page admins, editors and moderators can see the fans of a Facebook page. You’ll only be able to see fans who have set their likes to Public. 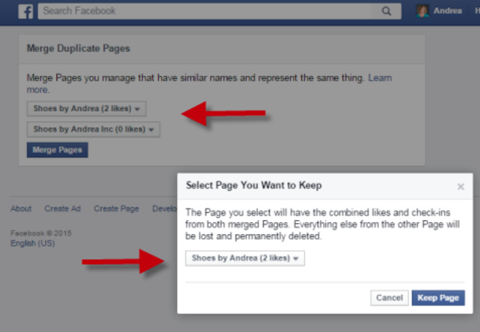 So you won’t be able to see every person who likes your page. There are two ways to see the people who have liked your page. One way is to login as the page and then click on the outline of the people at the top of the page. You thensee the most recent likes for your page. Select See All to see a longer list of likes. 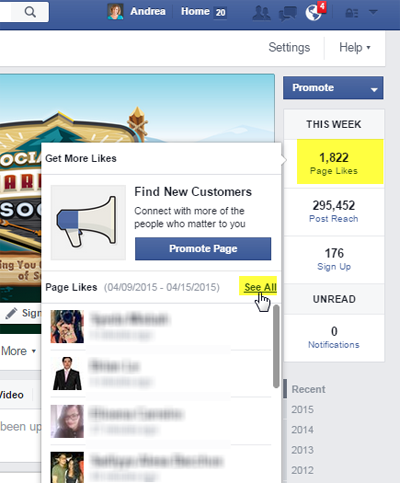 See your likes while logged in as your page. The other way is to go to the right sidebar on your page, hover over the Page Likes area and click See All from the pop-up box. 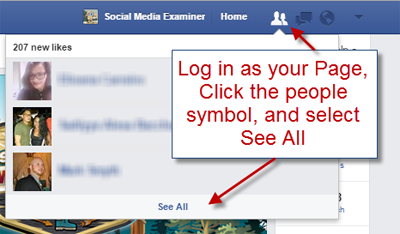 With this method, it doesn’t matter if you’re logged in as your profile or your page. See who has liked your page from the right sidebar. #5: Can I See Who Has Checked Into My Location? Unfortunately no. There are many people requesting this feature, but Facebook has yet to add this functionality. #6: How Do I Enable Ratings and Reviews? The Ratings and Reviews feature (where you see the star rating on the main Facebook page) is available when your page is categorized as a Local Business and has a physical address. By default, reviews and star ratings are displayed. However, you can change this setting if you’re in the Local Business category and don’t want to show your ratings and reviews. 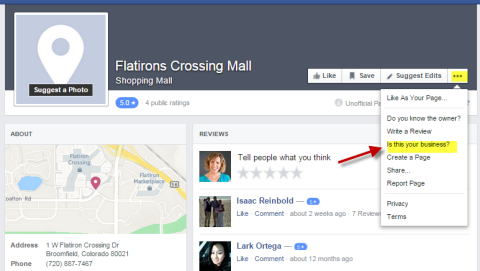 Enable or disable reviews on your Local Business page. To make sure this feature is enabled, go to the About tab, find the Address section and click Edit next to the address. You’ll see a map with your address. Check the box next to Show Map, Check-Ins and Star Ratings on the Page. #7: Can I Send Fans a Private Message? You can send fans a private message only if you enable the Message button and they send you a message first. This can be challenging if you run a timeline contest and want to get a message to someone who has won. If you enable the Message button, fans can send you a private message, and you can reply. If you enable your Message button, make sure you regularly check the messages on your page. The only workaround is to send someone a private message through a personal profile, but even then, the person has to have their Message button enabled on their personal timeline. And it’s very likely that if you aren’t friends, the private message will go into the Other folder. #8: How Do I Show a Video in the About Section? The video that shows up on the left sidebar of your page’s main timeline is known as a featured video. When you set your featured video, it’s more prominently displayed on your main timeline and appears larger on your Videos page. 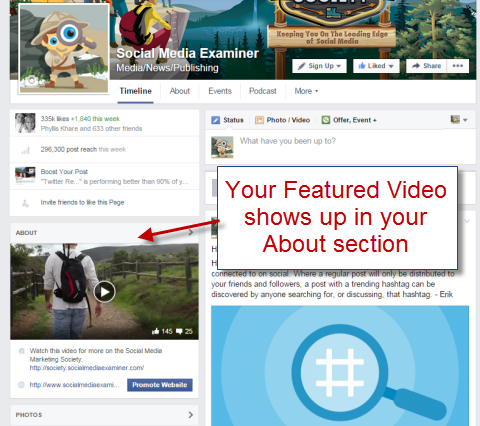 Highlight a video on your page by adding it as a featured video. To enable this feature, just click the Videos tab, click Add Featured Video and then select the video you want to feature. 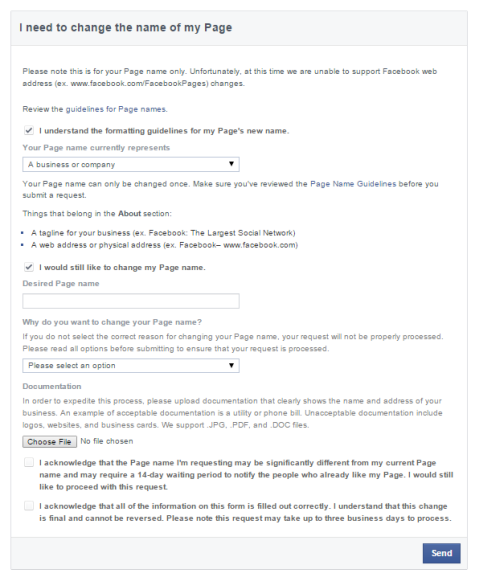 #9: How Do I Regain or Claim My Page Not Under My Admin Control? Sometimes a person sets up a page for a company, but then leaves without passing admin control to someone else at the company. Or it’s possible you may find a page that was created by someone else–maybe by people checking into your place–that clearly represents your business. You can claim a page with proper documentation or a phone call. Go to the page, click the three dots button and choose the Is This Your Business option. You can claim an unclaimed page. 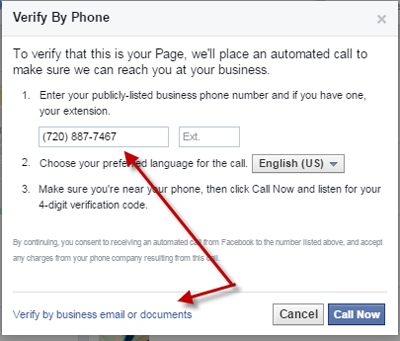 Once you start the process, Facebook will verify you with either a phone call to the business phone number listed, an email or proper documentation like a phone bill. You have to verify you’re officially connected to the business. After you verify you’re connected to the business, Facebook reviews your claim and decides whether you can be an admin of the page. If the Message button is open on the page, message the page to contact the owner. If the Message button isn’t open, post a message on the page. If you don’t get any response, report the page. To report the page, click the three dots button on the page (under the cover photo) and select Report Page. 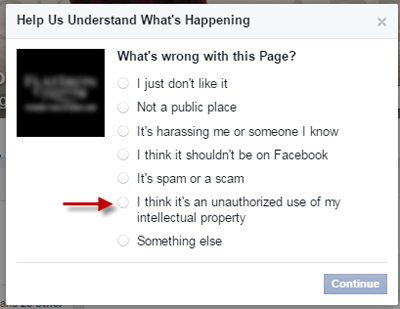 Then you have the option to claim that the page is using your intellectual property. To regain control, report a page that represents your business but is managed by someone else. Facebook reviews these cases, but it may take time. I hope that I’ve cleared up some issues that may be popping up with your business on Facebook. Facebook also has improved (in my opinion) their Help section, and the Help Community can be a good place to find answers as well.